At this year’s Amsterdam Symposium on the History of Food I talked to Jon Verriet, who’s been researching the history of the haybox. That’s an insulated container, into which you put hot food, which then keeps cooking thanks to the retained heat. Jon made the point that hayboxes often see an upsurge during times of war and hardship, when they can be promoted as good for the country because they save energy and money. Environmentally-aware types also like them, to save energy as they cook their lentils. Researching the haybox myself, I came across its modern incarnation, the Wonderbag, which neatly ties those two motivations together. When you buy one, perhaps for environmental reasons, you’re actually paying for two, one of which goes to a poor family to save money, fuel, time, water, everything. 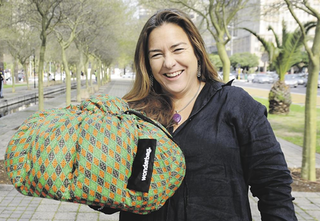 I thought that was worth a follow-up, and so sought out Sarah Collins, a South African social entrepreneur who developed the Wonderbag. The Wonderbag website tells the story and links through to the Wonderbag Foundation. The University of California at Berkeley study mentioned in the podcast concluded that the Wonderbag saves 8–21% of the time family members spend cooking, 10–36% of fuel costs, and allows families to spend 36–60% more on food. Banner photograph thanks to Annie Templeton at Goedgedacht Trust. Cover photo by Edrea du Toit for Netwerk 24. The haybox through history episode, for convenience.